Hiring a Lexington listing agent is crucial to your entire experience as a home seller. The person you choose will be involved in preparing your home for sale, establishing a listing price, marketing your property and negotiating the transaction. While you might be tempted to hire a friend who has a real estate license or your co-worker’s sister, remember that the person you enjoy meeting for drinks isn’t always the best REALTOR® to represent your interests. That friend could turn out to be the right agent for you, but before you choose him or her, take the time to get recommendations for several agents and interview them. You’ll be paying a significant commission to this person (often 6% of the sales price of your home), spending time with them, and relying on their advice to sell your home for the best possible price and as quickly as possible given market conditions. Many sellers are tempted to choose the REALTOR® who suggests the highest list price for their property and who gives their home the most compliments, but you’re better served by a realistic REALTOR®. When you talk to neighbors and friends about their recommendations for a REALTOR®, ask them how easy it was to reach the agent when they had questions, and how much support and advice the agent gave them throughout the sales process. Are you a member of the National Association of Realtors? REALTORS® must abide by the NAR’s code of ethics. In addition, each state’s real estate license requires continuing education for agents. How many sales did you complete last year? What was the average difference between sales price and list price? While this depends on your local market conditions, a REALTOR® who often sells homes well below list price may not be advising sellers to price their homes correctly or may be inadequately marketing homes. What is your marketing plan for my home? How many websites will include information about my home? Where will you look for buyers? Do you have advice for me about the condition of my home? Do you have expertise as a home stager or do you recommend that I hire a professional stager? Can you recommend contractors and moving companies? How often should I expect to hear from you when my home is on the market? Will you provide me with regular feedback and updates about potential buyers? The most important conversation you will have with your Lexington agent is about the price of your home. The REALTOR® you choose should present you with a comprehensive market analysis that compares similar homes that are on the market, have sold recently and have been taken off the market. You are paying for your REALTOR®’s knowledge and expertise, so listen carefully to the advice you receive and choose your agent thoughtfully. Come join us for the 5th Annual Bowman Adventure Run, a road and trail race not to be missed! Enjoy 3.1 miles through the streets and hills of the Bowman neighborhood, ending with the Dunback Meadow boardwalk and trails…lace-up your running shoes and come be part of the adventure! Registration is for the 5K - not the kids fun run! *Look for the Bowman Adventure Run table outside on the blacktop near the flagpole. (If inclement weather look for us under the shade structure behind the school @ playground). The start and finish will be in front of the Bowman Elementary School, 9 Phillips Rd, Lexington MA. It’s a road race. It’s a trail run. It’s a super way to spend an autumn Saturday with your friends, family and Bowman Community. There’s something for everyone. Lace ’em up for the Kids Fun Run. Enjoy the 5K through the Bowman neighborhood and its Big Backyard, followed by post-race festivities. Come join the Adventure and help Bowman celebrate its 50th year! This unique 5K will take off from Bowman, lead you through the rolling hills of the neighborhood and onto Bacon Street, a gravel road leading to Dunback Meadow. The last mile covers boardwalks and trails that are part of the extensive conservation land in Lexington. You will then cross the Bowman fields and the finish line on Worthen Road East. Click hereto view the 5K and Kids Fun Run courses. Please note: this adventure is for all ages but if you are under the age of 11, please participate with an adult. This year, the KFR will take place before the 5K so all you parents can cheer on your kids and run the 5K. The 3/4-mile course leaves from the front entrance of Bowman down Worthen Road East to Philip Road and back to Bowman. It’s complete with a water stop and finisher awards. Register the morning of the event to sign a waiver. This year the KFR will be free. Donations for Bowman will be accepted at the table. Register for the 5K adventure today! Register online at Bowman Adventure Run REGISTRATION before Oct 27th or the day of the race. Registration prior to October 16th will be $20 and after will be $25. Race packets will be available for pickup at Bowman School on Friday, October 28th (day prior to race) from 3:00 pm- 5:00 pm. Look for the Adventure Run table outside near rolling car pickup / at flagpole for your packet with bib number and shirt for the first 150 registrants! Or register by mail using the Mail-In Adventure Run Registration form. If you’d like to VOLUNTEER to be part of this race, please go to our online Volunteer sign up. Interested in becoming a SPONSOR of the 5th Annual Bowman Adventure Run? Please contact us at bowmanrun@bowmanpta.org. Lexington has more than 1,400 acres of conservation land, over 10% of the town, an impressive figure for a community so close to Boston. Conservation land provides the space to experience fresh air, green leaves, and the pleasure of a stroll through the woods right here in our own community. Conservation land also protects many beneficial functions that nature performs for us, such the flood control, water quality improvement, and air purification. And because all of Lexington was once farmland, forest, or wetland, conservation land helps to preserve the historic character of our town. When exploring Lexington’s conservation land, consider the hard work that many citizens and friends have contributed toward protecting and caring for these important properties. Conservation land is protected by the Conservation Commission and cared for by the Lexington Conservation Stewards, a group of citizen volunteers. Learn more atwww.lexingtonma.gov/conservation/stewards.cfm. Where: Lexington Community Farm 52 Lowell Street in Lexington, MA next to the Arlington Reservoir. 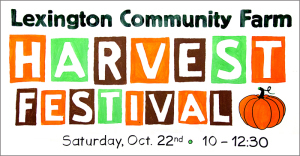 We will be holding a celebration of the fall harvest on the farm with food samples, live music, tours, kids’ activities and fun for the whole family! Free parking at the Arlington Reservoir, next door. Meet our farmers, Tim and Elena, take a tour of the farm, enjoy live musical entertainment from two bands, the Harmonators and the Sorry Honeys, learn about volunteer opportunities, watch vegetable races and visit the kids’ activity and education tables, nibble on tastes of the harvest and enjoy great shopping in the farm stand of produce as well as other products. In addition, the private farm behind us, Silk Fields Farm, will be open for goat, chicken, rabbit and now alpaca viewing. The farm is about 7.5 acres with a small farm stand, a glass greenhouse and a hoophouse. The Town of Lexington owns the property and is leasing it to Lexington Community Farm Coalition (LexFarm) to operate it as a community farm. It is on the site of the former Busa Farm, operated by the Busa family for many years. If you are ready to buy a Lexington home, congratulations! This fall season is a wonderful time to do so in the Lexington real estate market. Mortgage rates are still near historic lows, but experts predict they will begin increasing sooner than later. Home equity has returned for the majority of homeowners. Rent prices continue to soar. Now is a great time to buy! As your Lexington real estate agent, I recommend that the first step you take in the home-buying process is qualifying for a mortgage loan. Pre-qualified buyers are taken more seriously by sellers, because the seller knows you can afford their home, and because the home sale will go through faster. Also, pre-qualified buyers know exactly what they can afford, so it’s also a perk for you. You don’t want to fall in love with a Lexington home that is out of your price range! While many Lexington homebuyers stress about the mortgage process, numerous studies show that the qualifications are not as strict as most buyers think. There are many down payment options, so if you don’t have 20 percent to put down, you’ve got other options! You’ve also got options if your credit score is lower than you’d like it to be. Do check your credit reports and credit score. The higher your score, the better! Check your credit reports early, even if you’re not quite ready to buy, because if you find errors on them, it takes time to get them resolved. However, resolving these issues might raise your score to where it belongs. Don’t take on new credit/debt. This is true before you apply for a mortgage, and it remains true until after you officially close on your new Lexington home! That means that no time during your home-buying process should you buy a new car, plan a vacation, buy expensive furniture and so on. Don’t make large deposits. 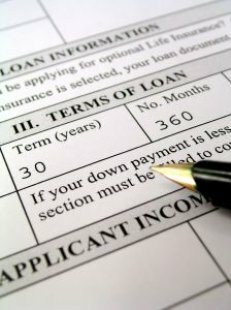 Once you are in the mortgage process, don’t add large deposits of money that can’t be traced, such as a family loan or gift. Mortgage lenders will have to track where the money is coming from and it can create issues that delay the process. Do stay in your job. Changing jobs during the mortgage process, or right before applying for a mortgage, is not a smart idea. Even changing positions within the same company can shake things up. Ask your employer if you can start after the closing date. You must have job stability in order to buy a home. These are just some tips to get you started! 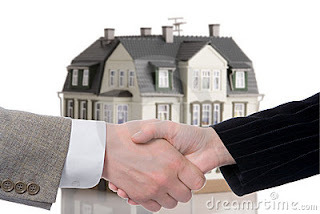 As a Lexington real estate agent, I want the home-buying process to go as smoothly as possible for you. When ready to begin your home search, or if you have questions, contact me! You’ve finally found it: a Lexington home you’re swooning over and dying to own. From the exposed ceiling beams to the hardwood floors, this feels like the place. So what’s next? Don’t just stand there dumbstruck; it’s time to dig deeper and ask questions—and not just the kind that randomly pop into your head, either. You need to hit all of the necessary topics head-on, and some of them are not so obvious. 1. What is the home’s sales history? When was the last time the house sold, and how much did the current owners pay for it? This is essential intel, and you don’t even have to ask the seller or your real estate agent about it, because it’s posted on every MLS listing. All you have to do is scroll down to find it. But make sure you know it. When buying a home, the previous sale price will give you a sense of what the sellers might expect you to pay—but keep in mind that a home’s true market value is based more on what comparable homes are selling for now rather than what it went for in the past, says Los Angeles Realtor® Jennifer Niman of Berkshire Hathaway Home Services. Sales history will also show you whether the home’s price has been trending up or down over time, which can help you hone your negotiating stance. 2. Did the sellers make any major renovations or additions? If they’ve overhauled the kitchen, added a bedroom, or finished the basement, you’ll want to know that—and, ideally, see receipts from contractors to get a sense of what they paid for these upgrades. In general, this will give you a ballpark notion of how much money they’ve sunk into the home—and what they hope to get out. That said, don’t assume you have to fork over as much cash as they put in; home improvements generally reap only a 64% return on average. And that return on investment varies widely based on which renovation is done. 3. How much are the property taxes? Property tax history is also typically available right on the listing detail page. If you can’t find it, ask the seller. You’ll want to find out what previous owners paid, but understand that the property tax, since it’s based on a percentage of the value of the house, will probably be affected by your purchase price. This could be a huge additional expense, and you’ll need to budget for that when putting together your offer. 4. What are the monthly maintenance and utility costs? Is there any type of homeowners association fee? Find out. Also learn what kind of power the house uses, be it gas, oil, electric, or a combination, and ask what the average monthly bill for each is. Also inquire about water, waste removal, and any other utility costs that are applicable. 5. Has there ever been a broken pipe? Sewer backup? This may sound trivial (not to mention unpleasant), but according to the Insurance Information Institute, broken pipes account for an estimated 22% of all home insurance losses. If the homeowner doesn’t ‘fess up, a good home inspector can probably find evidence of either one of these situations, so you might want to put these on your list of questions to ask your inspector, too. 6. How old is the roof? The 2015 Remodeling Impact Report from the National Association of Realtors® says the national median cost of an asphalt roofing replacement is about $7,600. It would be good to know how soon you might need to lay out that substantial amount of cash. 7. Have there ever been any pest infestations? If there was an infestation, when were pest control procedures undertaken? No, this won’t necessarily mean the house is pest-free at the time you’re buying it, but it’s a good starting point to know the history. Many buyers require that termite treatment be included in the price; it’s easiest to tent for pest removal when the house is empty, between owners. 8. Are there warranties on the appliances, HVAC system, garage door, etc.? And if so, can the homeowner provide the documentation? Ask for it. This can establish how old these features are, and give you an idea of when they might need to be replaced and how expensive it could be. It will also help you decide whether or not to buy a home warranty. 9. What are the parking restrictions around the house? Will guests need parking permits? How many permits are you, as the homeowner, allowed, and can you obtain more if you decide to throw a party? Also, check out the parking situation on the property itself. Will your car(s) fit in the garage? Is there room to park anywhere else on the property other than the driveway? 10. Does the house have any kind of unusual history? In many states, owners are legally bound to disclose if a death or major crime has occurred recently on the premises, but there are other circumstances you should be aware of as well. For example: Did anyone famous ever live there? Was it ever used in a film, TV series, or commercial? If so, you might have to deal with fans ringing your doorbell or driving by at all hours of the day or night. Oh, and if the house has a history of being haunted or paranormally “stigmatized,” you might have a little extra negotiating power when buying a home. Thanks, ghosts.